I was browsing my make up collection the other day and through the 1000’s of lipsticks and multitudes of brands, I realised that the Urban Decay logo seemed to prevail over the other brands present. 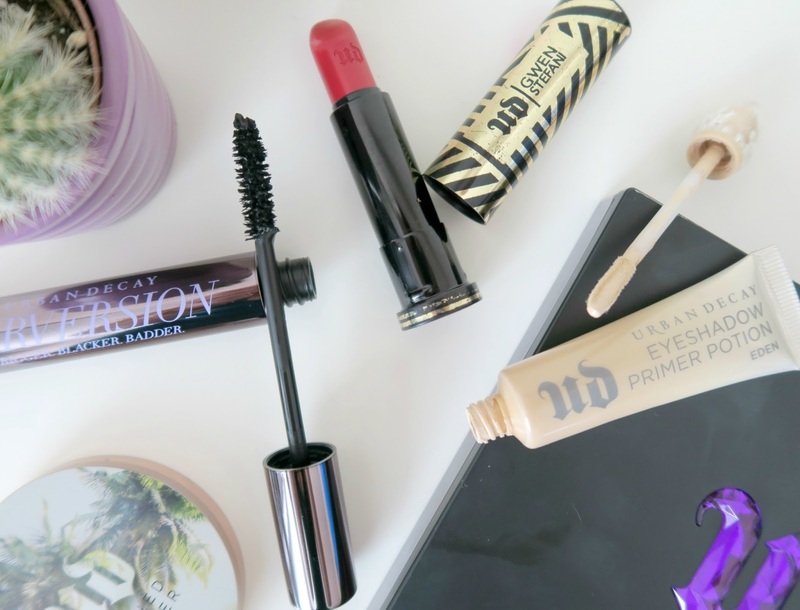 Within my every day make up routine, it seems that Urban Decay have created some of my most used essentials and have creeped in to be one of my favourite brands, without me even realising it. After evaluating my favourites, I whittled it down to three stand out products which every Urban Decay fan needs to get their hands on. Urban Decay Eyeshadow Primer Potion: I absolutely love, love, love this stuff. Not only is it great at emphasising the colour of your eyeshadow, but I also use it under my eye in the same way I use a concealer. The shade ‘Eden’ seems to be great at concealing dark circles and adding an extra level of ‘sticking’ power to whichever concealer you may use over the top of it. It can be used alone on a daily basis, but for a night out or a particularly long day out of the house, this stuff is the perfect base for anything within 5cm of your actual eyeballs. Urban Decay Gwen Stefani Lipstick in Spiderwebs: I’ve never met a more perfect red lipstick shade. With a powerful punch of red, this also has slightly blue undertones, which makes your teeth look slightly whiter. The staying power of this bad boy makes it perfect for nights out and it lasts and lasts and lasts. The finish is just perfect as well – not too matte, not too shiny. It just sits in a lovely way and completes any make up look. Urban Decay Perversion Mascara: A more recent addition to my Urban Decay collection, as I’d never tried one of their mascara’s before! In an ultra black formula this adds such a bold flash of black to your eyelashes and is also really easy to remove. Usually I wouldn’t be a fan of such a soft, big brush and opt for a more solid comb style, but the formula makes this so easy to apply and build up that it’s a compromise I’m willing to make. What are your favourites from Urban Decay?